Investors: Aprameya Radhakrishna (Founder of TaxiForSure), Venk Krishnan (NuVentures), Subramanya SV (ex-Partner of Bessemer VP), Kunal Shah (Founder of Freecharge), Anupam Mittal (Founder of People Group & Shaadi.com), Tracxn Labs and others. The major problem of living in metros is organizing our daily needs like Milk, Curd, Water etc. We either buy and keep goods the day before or face the hardship of getting up early to buy them. And especially if you are bachelor living alone or with friends this is the most hating task to do. Unlike Tier II or III cities where Milk man deliver milk every day, Kirana shop at every corner, we don’t have such options in metros. DailyNinja is a hyperlocal startup addressing this issue. They deliver your household essentials to your home every day early morning on a subscription basis. 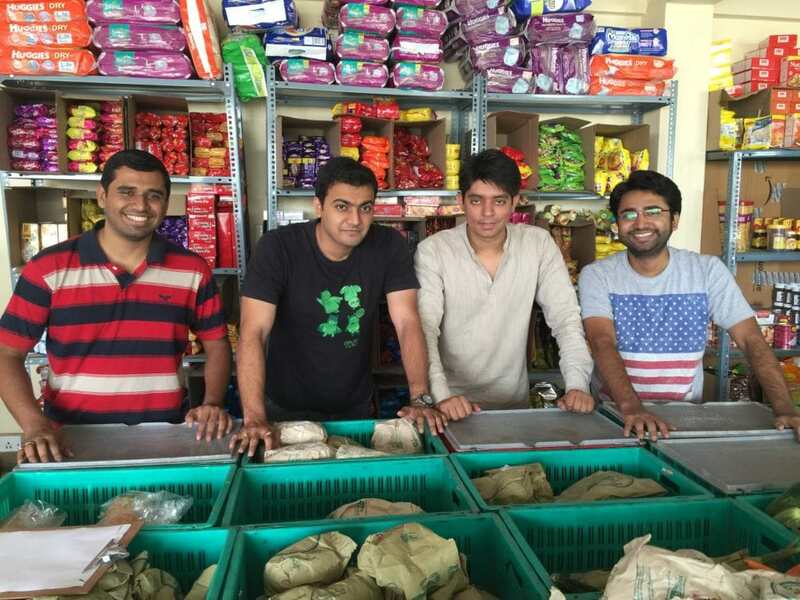 DailyNinja is co-founded by BITS Pilani graduates Sagar Yarnalkar and Anurag Gupta. Sagar and Anurag previously co-founded Appspire Technologies, a Mumbai based mobile services company. Prior to that, Sagar was co-founder at Scoot which he exited profitably and, Anurag was working at Goldman Sachs. Communicate Needs Easily – 11th hour addition/removal for that packet of milk. The service is currently available for users in Bangalore. That’s the kind off lesson every entrepreneur should learn about customer service. What is the biggest learning so far as entrepreneur? Sagar: Entrepreneurship teaches you a lot and is a very humbling experience, you realize the difficulty and challenges it takes to start something from scratch and give it a shape. More often than not you would end up with something very different from what you started. The first few 5-6 months are crucial, here you try to bring your idea from paper into the real world and you would realize all the constraints and bottlenecks. Always have a Plan-B and be flexible to new ideas. For our business, delivery is the key. Nothing is worse than angry unsatisfied customers. What’s the toughest challenge faced in the journey of DailyNinja? Sagar: Home delivery of household essentials is a complex business, with low margins and high delivery costs involved. Much of the customers’ requirements are recurring and subscription based. It is a high volume game which requires an asset light approach and optimization through technology wherever possible. Many companies in similar sectors are struggling due to excessive delivery and maintenance costs. Our challenge was establishing a different model which brings the biggest offline subscription based business in the country of Milk online and using the existing logistics network of vendors to enable delivery of other household products. Sagar: The network we are building is primarily based of referrals and word of mouth. We had to ensure that we add value to everyone involved and above all make our customers’ life easy. Sagar: When you have an idea, make sure it makes sense on paper (do the math thoroughly). Make sure your addressable market is big enough and you can earn money, lots of it. What’s your tip for entrepreneurs looking to raise funds? Sagar: Always make sure you raise money from the right guys. When you pitch your idea always be sure to give very clear examples that highlight the problem you are trying to solve, it works best when the investor identifies with the problem and feels what you are doing is the correct solution. You have to make sure you transmit your idea clearly and make the investor believe in your vision. DailyNinja raised Seed and a Pre-Series A round so far. The first round was led by Aprameya Radhakrishna (Founder of Taxi For Sure) with participation from Venk Krishnan (NuVentures), Subramanya SV (ex-Partner of Bessemer VP) and others. Their existing investors participated in the latest round of Pre-Series A as well, with Venk Krishnan leading the round and both Aprameya and Subramanya again took part. Along with them they got Kunal Shah (Founder of Freecharge), Anupam Mittal (Founder of People Group & Shaadi.com), Tracxn Labs and others. DailyNinja is looking to deliver to 20,000 households every day by the end of this financial year. They are also looking forward for expanding to other cities as well.